My Filet Crochet patterns are available HERE. Filet crochet is done primarily with crochet cotton thread, but can also be done in larger yarn. It is usually worked only in one color. I recall some interesting filet work from the 90s which involved color changes. I never tried it, but it was extraordinary work. 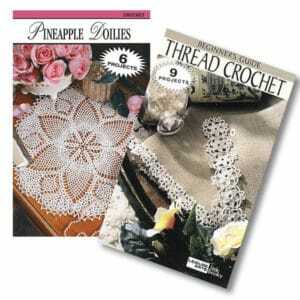 Some crochet historians believe that “true filet crochet” can only be done with size 40 crochet thread. But, these days, you can use whatever you like to create your projects. When working in filet crochet, I find that the most difficult part is making my crochet mesh as square as possible. Most graphs are going to be in squares, whereas many times, when actually crocheting, the mesh squares are wider than they are tall. So, the key is to find what works best for you. The small graph above is a symmetrical graph. Although most graphs will be read “right to left” on odd-numbered rows and “left to right” on even-numbered rows, it won’t make any difference for this example. 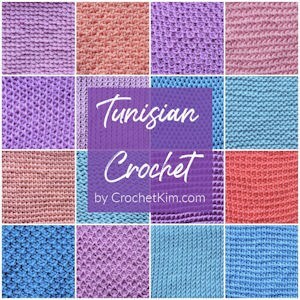 If you are using an actual filet crochet pattern, there is usually a chart or key provided to let you know what the designer intended as the mesh squares but, remember that it is what worked for the designer. 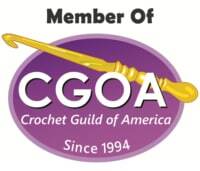 For me, personally, I like to use ONE chain in between double crochets. However, the normal filet pattern has TWO chains in between the double crochets. Since it works better for me with only one chain, I would normally follow the graph but use the method that suits me best. If you are unable to get a square from the mesh, the picture you are “painting” in filet crochet will be squattier than the chart. Sometimes you may not care. A squattier heart, for instance, isn’t going to be a big issue but, with other projects, it may be an issue for you. The primary goal for me in filet crochet is getting the square. Let’s start with this graph. 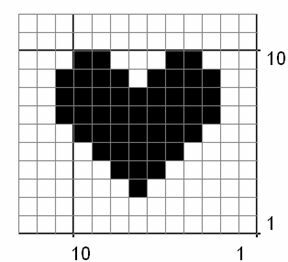 Start by reproducing this heart graph into crochet. 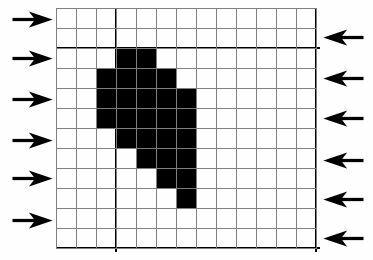 Take a look at the graph and you will see a grid. The horizontal and vertical lines form the grid. 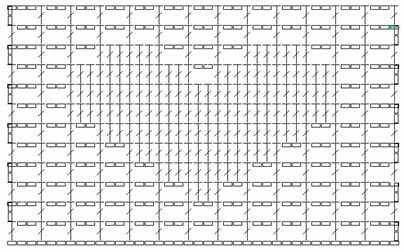 Your long stitches (whether they are double crochet or treble crochet) will form that grid. There will be open spaces between the long stitches and closed spaces where you see the heart. 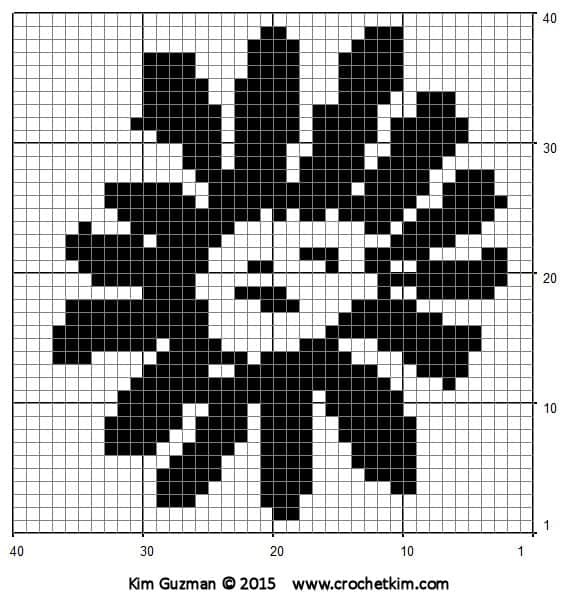 The following charts will show each individual stitch as you crochet it. In order to find out what method works best for you, you’ll need to work the project and measure each one to see which produces the closest thing to a square. Be sure to use a ruler or measuring tape here. To the eye, a crocheted square tends to look like a rectangle. I will give you a hint about where to start. 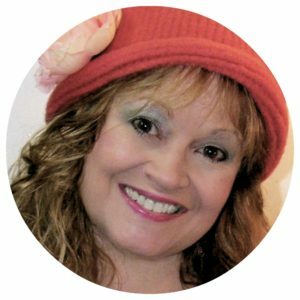 If you tend to be a tight crocheter, start with either the Two-Chain Method or the Treble Crochet Method. 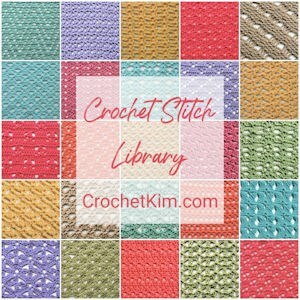 If you are a looser crocheter, start with the One-Chain Method. If you tend to make your chains tightly and often have to go up in hook size because your chain at the bottom of an afghan is too tight, go straight to the Two-Chain Method. When doing the turning chain, you work 3 chains for the double crochet, plus 1 in the One-Chain Method or plus 2 in the Two-Chain Method. That makes a total of 4 in the One-Chain Method and 5 in the Two-Chain Method. However, if you are one of those people who, like me, prefer to do only 2 turning chains for a double crochet, you will decrease 1 stitch for either method. When using one chain in between, you will count the number of columns, multiply by two and add 5 for the beginning chain. Begin with your first double crochet in the seventh chain from the hook. For this graph, there are 13 columns, multiplied by 2 and adding 5, you have a starting chain of 31. When using two chains in between, you will count the number of columns, multiply by three and add 6 for the beginning chain. Begin with your first double crochet in the ninth chain from the hook. For this graph, you have a starting chain of 45. 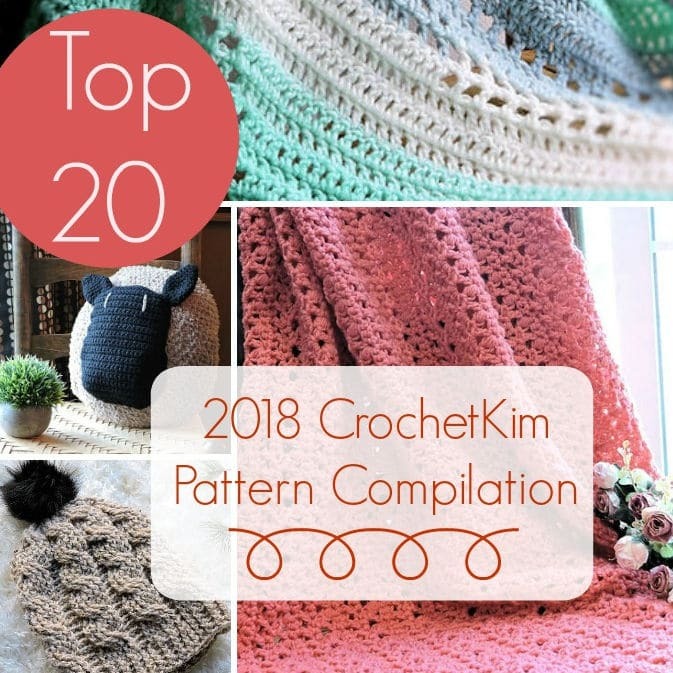 For the last method, you will use the same chart as the Two-Chain Method except that you will replace the double crochets with treble crochets. 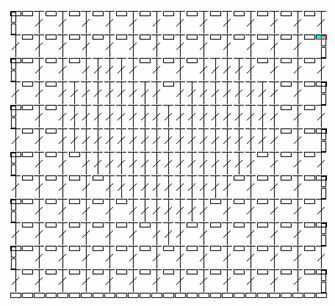 For this method, you will start with a chain of 46 and start crocheting into the 10th chain for the foundation row. 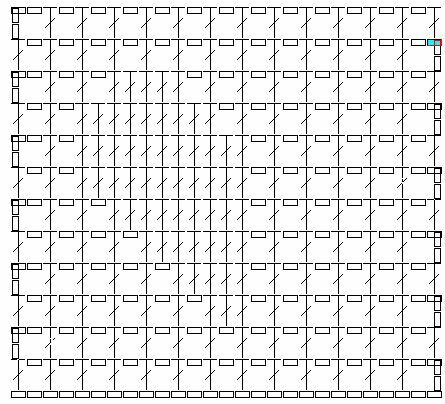 The next step for learning filet crochet is that, in most graphs, you must read it left to right for one row and right to left for the next row. You didn’t have to do this with the heart graph above since both sides of the heart are the same. However, for the next graph, you will have to be sure to read the graph in opposite directions for every other row. This is the same graph, only with half the heart. The arrows indicate in which direction you will read each row in order to complete the project below. Below is an example of this graph charted out. Although this is the One-Chain Method, you can use either of the methods already discussed. Try out your new Filet Crochet skills with this small chart. Use either method that gives you the best square mesh.